As the shipping arm of ADNOC and its Group of Companies, Abu Dhabi National Tanker Company and National Gas Shipping Company Ltd. (ADNATCO NGSCO) delivers the UAE’s energy to the world. Guided by our mission of providing safe, efficient and environmentally responsive transportation of cargo by sea; NGSCO tankers carry LNG from ADGAS’ liquefaction plant at Das Island in the Arabian Gulf to our customers in Japan. ADNATCO is involved in the global transportation of petroleum products and bulk cargo of sulphur as well as polyethylene produced by ADNOC’s petrochemicals subsidiary Borouge from its plant in Ruwais. We have expanded our fleet by taking delivery of 17 new vessels in 2010-2011. The new vessels comprise handy-sized bulk carriers, Panamax and Aframax tankers and bulk carriers. With the new ships, ADNATCO & NGSCO became a major regional shipping company with diversified ships varying between LNG, bulk carriers, chemical and products tankers as well container vessels. To further support our effective operations, the functions of the two companies’ support services were merged in 2009. The objective of the merger was to consolidate and re-engineer the existing structures of ADNATCO & NGSCO and to provide integrated support services, secured operational efficiencies and maximized cost effective utilization of resources. As part of our commitment to provide a safe and secure working environment for our employees and to prevent pollution in all forms, our fleet receives high standard training on-board, from the company mobile trainer. We use environmentally-friendly gas in our ships and we have excellent class endorsed ballast water management. Our fleet is also provides a very high occupational health standard in line with ADNOC and international governance. It is, therefore, through this policy of total safety, efficient operations, investing in human resources and being environmentally responsive that we successfully deliver the UAE’s energy to the world. ADPC Marine Services provides a range of world-class marine services to vessels calling at all ports developed and managed by Abu Dhabi Ports Company across the Emirate. These facilities include pilotage, harbour towage, mooring and related services, Vessel Traffic Services (VTS) and aid-to-navigation (AtoN) services. Wholly owned by the Abu Dhabi Ports Company, ADPC Marine Services has a team of more than 160 experienced harbour pilots, marine crew, technicians and other staff who bring knowledge, professionalism, advanced skills and a customer focus to their work every day. This team is dedicated to ensuring the safe and timely passage of vessels through Abu Dhabi’s ports -- 24 hours a day, seven days a week. Supporting these efforts is the advanced fleet of tugs and other boats of ADPC Marine Services and its sophisticated VTS and aids to navigation (AtoN) systems. As a result, ADPC Marine Services has the marine assets, the technologies, the skills and the commitment to deliver safe, timely, best-in-class marine services to vessels across a wide range of size and category. Professionally managed insurance service provider and a leading brokers staffed with seasoned, dedicated professionals poised to provide the client with a new standard in service, quality and expertise. . Established in the year 1982. Company headed by Managing Director - Mr. Subash Chandra Shukla. Team comprising of qualified and experienced personnel. Specialist in Charterer’s Liability, Marine Hull, Protection & Indemnity, Builders Risk, General, Marine Cargo , Demolition Voyage Insurance, Medical, Life, Jewellers Block etc. Dealing with sound and professional underwriters like Skuld, American IG Club, Gard, Navigators, Raets Marine, GIC Re, Canopius,, Al Sagr, New India, Oriental, Tokio Marine, RSA, AXA etc. Making sure that clients are insured in accordance to their needs and their requirements are met at the time of issuance of policy and claim as well. Serving our worldwide clientele from Dubai and Sharjah. Subash Shukla is also holding 40% share in First Insurance World office registered broker with IRDA since 2004. Having offices in Chennai, Tuticorin and Ahmedabad – India. Department of Seaports & Customs, Sharjah, Sharjah Seaports Authority manages the three ports of Sharjah Port Khalid, Port Khorfakkan and Port Hamriyah. The three ports of Sharjah are the leading trade gateway to the UAE and handle all kinds of ships and caroges. The three ports in total have 33 berths, handle in excess of 10 million tons of bulk and general cargo, over 2.5 million TEU's of containerised cargo, around 52000 ro-ro units and over 6500 vessels in a year. Cargo volumes handled have been recording consistently steady growth over the last several years. Port Khalid a multipurpose port located in the city of Sharjah serves as a vital entry point to the Industrial heart land of UAE. Hamriyah Port located north of Sharjah and adjacent to the fast growing Hamriyah Free Zone is a deep water port with an alongside depth of 14 M handling general cargo and oil tankers. Port Khorfakkan a highly efficient container terminal renowned for its productivity is located on the East Coast of UAE which makes it a perfect transshipment hub for the region. Drydocks World is one of the most prominent names in the maritime industry. Over the past 31 years Drydocks World, with facilities in the Middle East and Southeast has become one of the most prolific shipyards in the world providing marine & maritime services to the shipping and offshore oil, gas and energy sectors. The range of services provided include Offshore and Engineering, Ship and Rig Repair and Maintenance, Shipbuilding and Conversion, Rig Building and Refurbishment, FPSO/FSO Conversion, Offshore Fabrication, Maritime Clusters and Yacht Repairs and Fleet Operations. The Drydocks World facility in Dubai is the largest and most modern facility between Europe and the Far East and is supplemented by four other fully operational facilities; one in Singapore and three on Batam Island, Indonesia, under DDW-PaxOcean Asia Pte. Ltd.. Drydocks World is building pioneering projects for key global players because of its excellent reputation in implementing the highest possible standards in HSE. These include the world’s largest turret for Shell’s Prelude FLNG in Australia, the Solan subsea storage tank – one of the largest - for Premier Oil in the UK, the gigantic DolWin Beta HVDC Offshore Platform Structure for wind energy farms off Germany and the conversion of tankers-to-Modular Capture Vessels for AET Ship Management in the Gulf of Mexico. Drydocks World received the prestigious 7th Cycle Mohammed Bin Rashid Al Maktoum Business Award – 2013 in the manufacturing category. This is the highest level of national recognition for business performance excellence that an organization in the UAE can achieve. Drydocks World is certified by Lloyds Register Quality Assurance for meeting ISO 9001, OHSAS 18001 and ISO 14001 requirements, and authorized by ASME and National Board of Boiler and Pressure Vessel Inspectors for the usage of ‘U’, ‘R’ and ‘NB’ Stamps. The company has received formal recognition through American Petroleum Institute (API) Specification Q1 certification. Drydocks World-Dubai has maintained since 2003, a British Safety Council 5-Star Award for its safety management system, a proud recipient of the coveted British Safety Council Sword of Honour for 2013 and has been recognized with the “Best International Enterprise” award at the 2014 Socrates Awards. Maritime World oversees Dubai Maritime City, a purpose-built entity, which is strategically located to serve the maritime industry of the world with its state-of-the-art facilities and expertise. The City was engineered to cater for the maritime industry needs by having the marine district and commercial district specially developed for multi- purpose use to support the maritime culture. The Maritime cluster also has an Academic Quarter which houses the Emirates International Maritime Academy offering a wide and relevant range of training and educational courses. Also managed under Drydocks World is the Jadaf shipyard. Located at the end of Dubai Creek, Jadaf was conceptualized and developed as a premier ship lifting, docking and undocking yard in 1978 under the guidance of late H.H. Sheikh Rashid Bin Saeed Al Maktoum, then Ruler of Dubai. Dubai Trading Agency Group (“the Group”) has its origins in Dubai Trading Agency LLC, which was established in 1973. Over the years, the business of Dubai Trading Agency LLC has expanded globally, and it has grown to include several subsidiaries and associate businesses. In order to more effectively manage this network of related businesses, senior management have created the Dubai Trading Agency Group as the quasi-holding company for all of the various interests. DTA Group operates through a network of subsidiaries and associates registered in the UAE, the UK, Singapore, Monaco and other offshore locations. The Group is headed by Mr. Tahir Lakhani, the original founder of Dubai Trading Agency LLC, and, since 1985, it has been primarily in the business of buying and selling ships, with particular focus on the demolition market: buying ships targeted for recycling from ship owners and selling them to the Sub- Continent & China. In recent years, the Group has been one of the largest cash buyers in the global market. The Group has recently begun to broaden its activities and is now active in the areas of Shipping Operations, Ship Recycling, Ship Agency Services & Ship Management. Our dedicated commercial practice has a wealth of experience in contractual and advisory work across a broad spectrum of industry sectors. The firm is by now the Corporate, Litigation and Maritime Law firm of choice in the Middle East, serving a worldwide base of clients with interests in the region. Our Corporate and Commercial department understands your business, culture and goals. We understand issues across a broad spectrum of business and legal practices and offer an extensive range of legal services relating to banking and finance transactions, real estate acquisitions, construction, company establishments in the UAE and the UAE Freezones, as well as debt recovery services. Our pioneering solutions extend beyond practices and borders, just as your business needs, combined with strategic advice to ensure the best for your business. We have the practice and knowledge on our side to efficiently resolve legal, regulatory and commercial conflicts wherever they arise on your behalf. Our bank of experience in litigation covers UK, UAE and DIFC jurisdictions and work on international and local arbitration cases, most notably with bodies such as ICC, DIFC-LCIA, DIAC, LMAA, LCIA, GMAA, GAFTA and FOSFA. We are the first lawfirm having enforced an International Arbitration Award in UAE Courts under the NY Convention. Fichte & Co has been actively involved in the development of the maritime industry in the region since its inception in 2005. Although the firm may be considered relatively young, all together the shipping team of Fichte & Co has nearly a century experience in advising ship owners and other players in the industry. Our shipping team comprises of dual qualified Lawyers carefully selected for their extensive academic knowledge and international background which allows them to offer legal advise not only on UAE and English law but, directly or through their network, virtually on all jurisdictions. In addition to the usual legal services a law firm is providing, we work closely with various government entities on various Maritime related issues. We are also the exclusive firm of choice today for the largest tanker Owners/Operators in the UAE, advising them on various contentious and non-contentious matters. With arguably the largest team of maritime lawyers in the UAE, we advise on all areas of maritime law, including ship finance and shipping litigation. Our coherent and comprehensive legal services cover topics ranging from Admiralty issues like salvage, wreck removal and pollution matters, to liabilities apportionment, conflict of laws and jurisdictional advise and standing regulations. Claims handling and claims management forms an important part of Fichte’s maritime portfolio with P&I Clubs, H&M Insurers, brokers, ship owners and financial institutions constantly approaching us on ship arrest and enforcement of maritime debts and securities or Maritime Arbitration conducted under ICC, LCIA, LMAA or GMAA rules. We also have unparalleled experience and expertise to advise and assist in arbitration matters under ICC, LCIA, DIFC/LCIA and represent client as mediators for dispute resolution, reducing costs. The idea of establishing Islamic P&I Club (IPIC) as a mutual and non-profit organization was proposed and approved by the Organization of the Islamic Shipowners’ Association (OISA), affiliated institution to the Organization of the Islamic Cooperation (OIC). In the 23rd Executive Committee Meeting and the 15th General Assembly Session in October 2001 held in Dubai, the Members of the Organization unanimously approved the procedure of the establishment of Islamic P&I Club and Islamic P&I Club was officially born. The achievement was adopted by the 10th OIC Summit, which was held in Putrajaya, Malaysia in October 2003 and Summit following the RESOLUTION No.35/10-E(IS). As per kind auspicious of the Government of Dubai, Islamic P&I Club headquarters officially established is in Dubai without the need for sponsorship in 2004. In order to have better access to the clients either potentials or current members, IPIC organized a second management office in Jakarta – Indonesia in 2009 while Istanbul – Turkey will be IPIC third office. It is policy of the Club to have offices in Beirut – Lebanon as well as Cairo – Egypt in due course. IPIC provide the most comprehensive and tailor-made cover to its members for protecting their third party legal liabilities and expenses out of the vessel’s operation up to the limit of liability USD 1 Billion as well as Freight Demurrage & Defence, Charterers’ Liability, Loss of Hire and War Risk, Hull & Machinery and K&R through its associate companies. Risks are reinsured through a syndicate of prominent international reinsurance companies to secure the member’s needs in a proper manner. 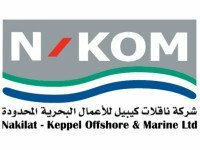 Nakilat-Keppel Offshore & Marine (N-KOM) is a joint-venture between Qatar Gas Transport Company (Nakilat) and Keppel Offshore & Marine. Strategically located in Qatar, the facility comprises of two graving docks (400m x 80m, 360m x 66m), berthing capacity of 2,750m, mobile boat hoists (300T & 1,100T), workshops and sub-contractor facilities on-site as well as two floating docks that will be ready by 2015. The API- and ASME-accredited facility offers repair, conversion, fabrication and maintenance services for marine, offshore and onshore vessels/structures. Having delivered over 250 projects for various industry players, N-KOM is the preferred shipyard delivering solutions in the Arabian Gulf. Established in September 2006 as a wholly owned entity of the Government of Sultanate of Oman (GOSO), Oman Drydock Company SAOC (ODC) truly embodies the spirit of a nation that stands tall amongst the strong economies in the region. ODC has been established under the master plan of Duqm area that is being propelled by the GOSO with the aim of diversification of industry structure and regionally balanced growth in Oman. The company’s business involves Ship Repair & Conversion, characteristics of which will reflect a combination of intensive human involvement and sophisticated technology. Operating one of the largest graving docks in the region, ODC with its geographical advantage, has started attracting the attention of major shipping and ship management companies worldwide. A 10-year management contract in place between ODC and Daewoo Shipbuilding & Marine Engineering Co., Ltd (DSME) in South Korea, a leading shipbuilder in the world, will ensure complete organization for talent, experience and technology to the benefit of Oman in the diversification of its economy. ODC is looking into a promising future for its stakeholders with estimated revenues of about USD 225 million and a 4,000 workforce by the year 2020. Oman as a nation has been in transformation to a modern state over the last four decades under the able leadership of His Majesty Sultan Qaboos bin Said, and Oman Drydock is but a monument of the success of the vision of His Majesty and testimony to turning that vision into reality. Samsara is one of the leading, fastest growing and most reputed Shipping Agency Groups in India. The Group today is holding an enviable position as a market leader in the Indian Shipping Agency and Freight fraternity and also being one of the youngest companies in the industry to establish a network of nationwide offices providing Professional Shipping Agency solutions to its worldwide Principals and Customers. Samsara has in the span of these few years, dynamically grown to a staff-strength of over 400 personnel managing 55+ owned offices across various Port locations and ICDs in India, an achievement second to none in the Indian sub-continent. The Samsara group believes its most valuable asset is its people. It is they who contribute to building lasting relationships with customers. An interconnected network of office branches with world-class ERP systems provides full control and transparency. Coupled with our cutting-edge technology is that essential personal touch that our people provide to each of our Principals, Shippers and Customers. The mission with which the Samsara group was founded still remains our driving force. Building relationships has inspired our growth and has given us the strength to aim higher. Sical Logistics Ltd., founded in 1955, is India's leading integrated logistics solutions provider with over five decades of experience in providing end to end logistics solutions. In 2011, Sical was acquired by the Coffee Day group, one of India's fastest growing business conglomerates with interests ranging from coffee plantations and agri-businesses, commodity exports, stakeholdings in leading IT and embedded technology companies, real estate and hospitality. While traditionally known for its stevedoring, customs handling, trucking and steamer agency businesses, Sical today has made significant investments in logistics related infrastructure and operates mechanized port terminals (container and bulk), container freight stations, container rakes, rail and road terminals. In addition to above, Sical also provides offshore support services to the oil and gas industry and owns and operates cutter suction dredger. With its extensive experience in handling bulk commodities over the decades, Sical has entered the mining space with innovative mining and cargo handling solutions at mines. At Sical every aspect of logistics namely port handling, road and rail transport, warehousing, shipping etc. are combined as an integrated logistics solutions and tailored to meet individual client needs. This is aided by investments in state of the art Infrastructure, equipment and handling facilities to provide cargo handling efficiency. Sical also offers comprehensive custom made yet cost effective solutions depending on specific needs enhancing flexibility, safety and reliability norms. SOHAR Port and Freezone is a deep sea port and free zone in the Middle East, situated in the Sultanate of Oman around 200 kilometres northwest of its capital Muscat. With current investments exceeding $15 billion, it is one of the world's largest port and free zone developments and lies at the centre of global trade routes between Europe and Asia. SOHAR provides unequalled access to booming Gulf economies while avoiding the additional costs of passing through the Strait of Hormuz. The existing road network and the future rail system and airport provide direct connectivity to the UAE and Saudi Arabia, as well as to the rest of the world. Equipped with deep-water jetties capable of handling the world’s largest ships, SOHAR has leading global partners that operate its container, dry bulk, liquid and gas terminals including Hutchison Whampoa, C. Steinweg Oman, Oiltanking Odfjell and Svitzer. SOHAR Port and Freezone is managed by Sohar Industrial Port Company (SIPC), a joint venture between the Port of Rotterdam and the Sultanate of Oman. Emirates Classification, TASNEEF was established in 2012 as the First Classification Society in United Arab Emirates as well as in the Gulf Cooperation Council (GCC) region and Arab world. On July 8th 2013, the National Transport Authority (NTA), who is the Maritime Administration for the UAE, officially recognized Emirates Classification, TASNEEF to act on their behalf to conduct statutory surveys and certifications. TASNEEF has rapidly established and followed the company core values, vision, and mission, to be the preeminent Classification Authority in the UAE. The primary mission of TASNEEF is to serve the UAE's interest, as well as the needs of our clients by promoting the security and safety of life and property, and protecting and preserving the natural environment in our vital Maritime Domain and to promote Emiratization and to provide training and career paths for the UAE men and women. TASNEEF has initially operated in the UAE market, with plans for regional and world-wide expansion. TASNEEF has demonstrated through partnerships and projects to be an effective and efficient provider of marine and offshore Classification Services. TASNEEF continually achieves this through strategic agreements with established Classification Societies, Experienced Leadership, Professional Staff, to apply Leading Edge Technologies. TASNEEF provides the Maritime Industry locally and regionally the highest international standards relating to Safety, Environment, Comfort of life and property, and Environment Protection and Prevention aboard Maritime centric assets through certification processes for the following; Ship Classification, Statutory Services, Certification of Materials and Components, Maritime and Naval Advisory, and Training. United Arab Shipping Company (UASC) is a global shipping company based in the Middle East. Founded in 1976, UASC is present in more than 75 countries around the world. The company is a major container shipping player in the Middle East region and adjacent markets, covering over 200 ports and destinations worldwide. UASC offers containerized and conventional cargo transportation, temperature controlled cargo and value added services to a diversified global client-base, covering the Middle East, Europe, Mediterranean, Indian Sub-continent, Far East, Australia, West Africa and The Americas. UASC is currently implementing one of the industry’s largest and most technologically advanced newbuilding programs with seventeen new vessels on order; six 18,000 TEU and eleven 14,000 TEU containerships. UASC’s cutting edge vessel designs have been developed focusing on cost efficiency and enhanced environmental friendliness. These vessels will be the first large containerships in the industry that will be delivered ‘LNG ready’ to enable dual fuel (the use of both traditional heavy fuel oil as well as LNG fuel), which is expected to significantly reduce environmental impact and reduce fuel costs.